Use me to cook and serve straight to the table... no washing up A tip from our cooks in the kitchen... Pop slices of your left over Sunday roast in a tray, top with gravy made with roasted onions and sherry vinegar. Freeze and enjoy as a special mid-week dinner. Important: Remove label and wash tray before use. During cooking, support the base of the tray when moving and take care as they may contain hot juices.<br>Salt and acidic foods may occasionally attack foil causing holes and discolouration. 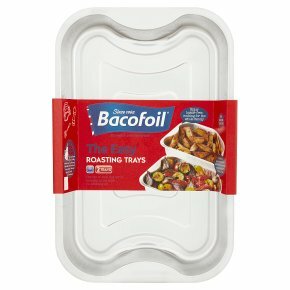 To prevent this form occurring, lightly coat with cooking oil<br>Always consult your manufacturer's instructions before using foilware in a microwave oven.<br>Keep foil container away from electric elements and do not allow them to come into contact with naked flame.